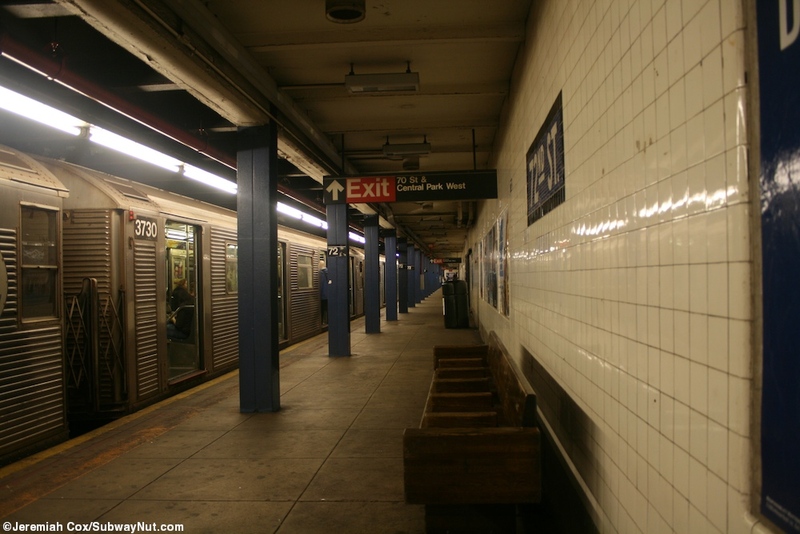 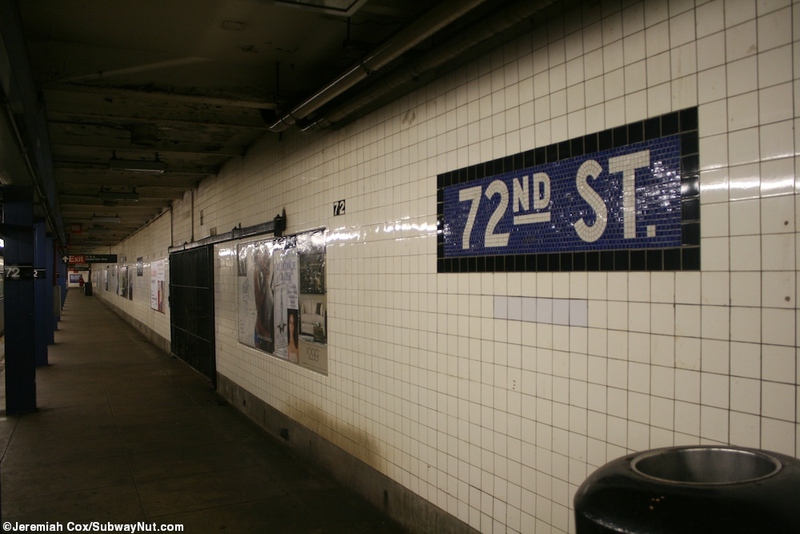 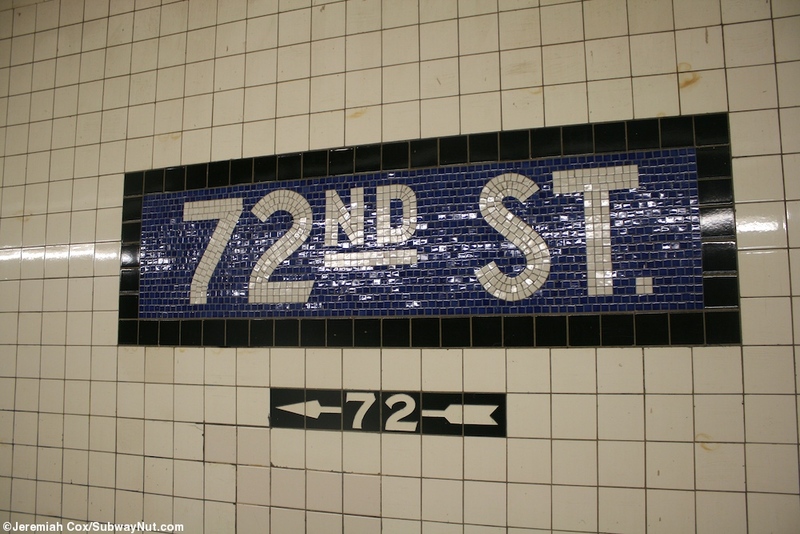 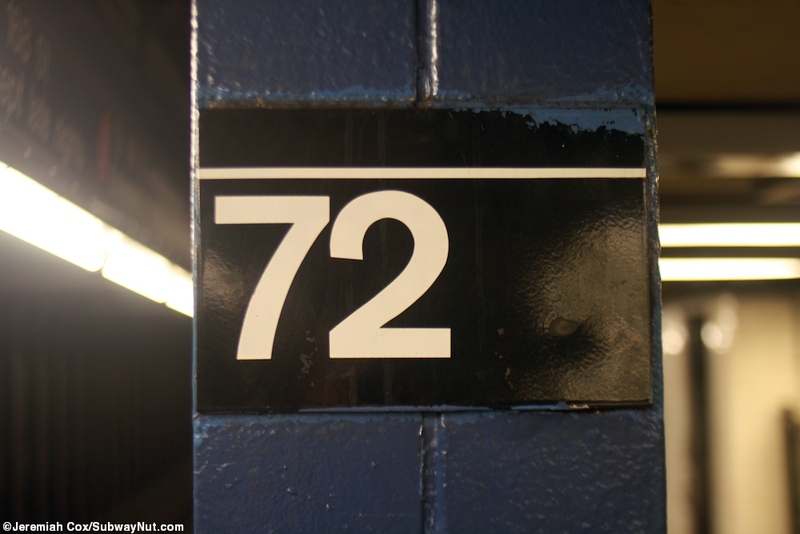 72 Street is a local stop on the Central Park West Line with its unusual stacked configuration with uptown trains on an upper level above downtown trains and both local platforms stacked and directly beneath the west side of Central Park West so there are no entrances on the park side of the street. 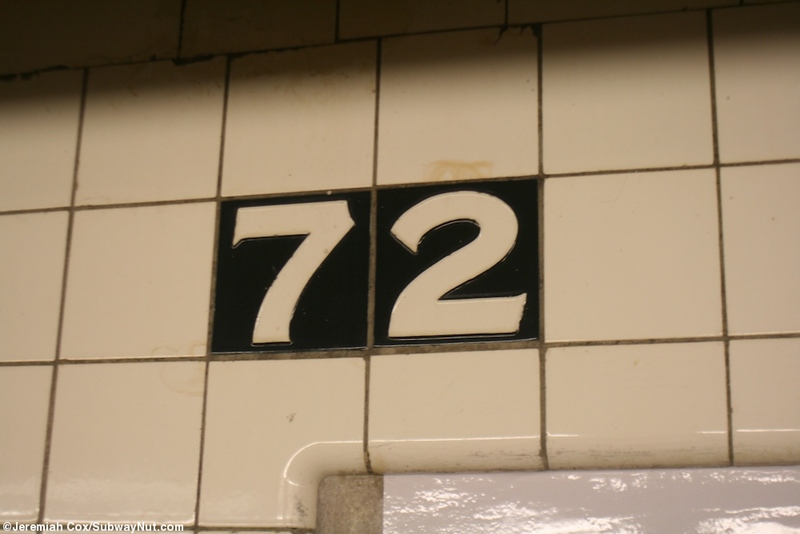 This station has the standard blue name tablets with no actual trim line but little 72s mapping out where one would be. 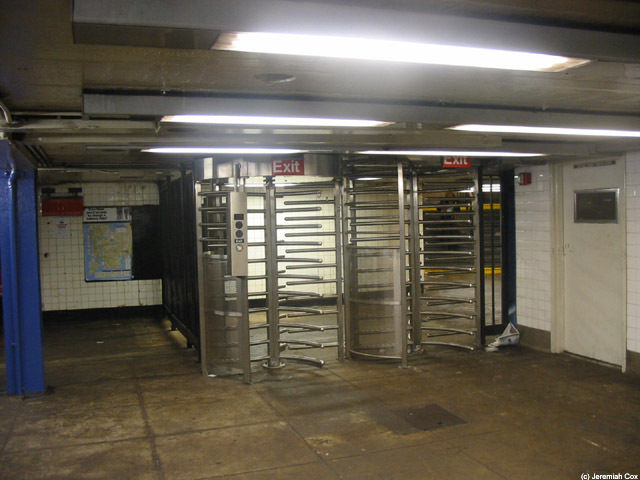 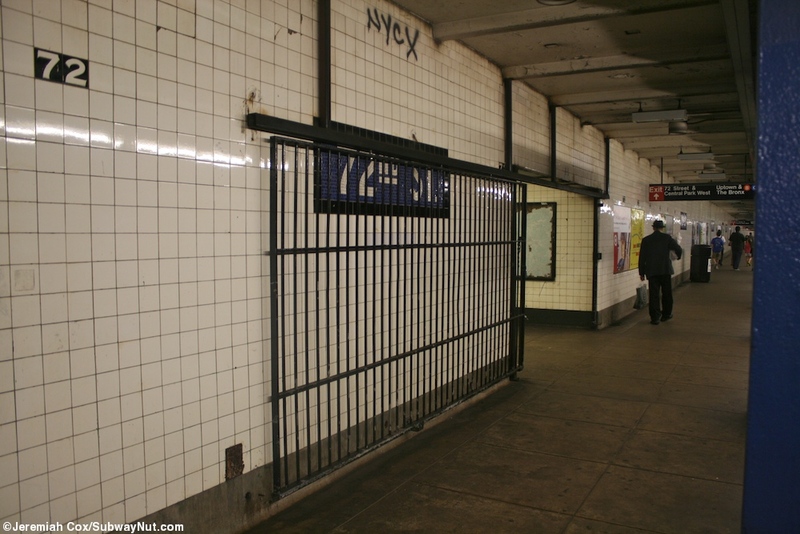 The main station exit is at its northern end where two staircases connect from the downtown to uptown platform to a fare control area with turnstiles and the token booth along that platform and street stairs out to the SW and NW corner of CPW and 72 Street, the staircase to the NW corner is in the category of unusual street stairs designed to fit in with the metalwork fencing along The Dakota apartment building. 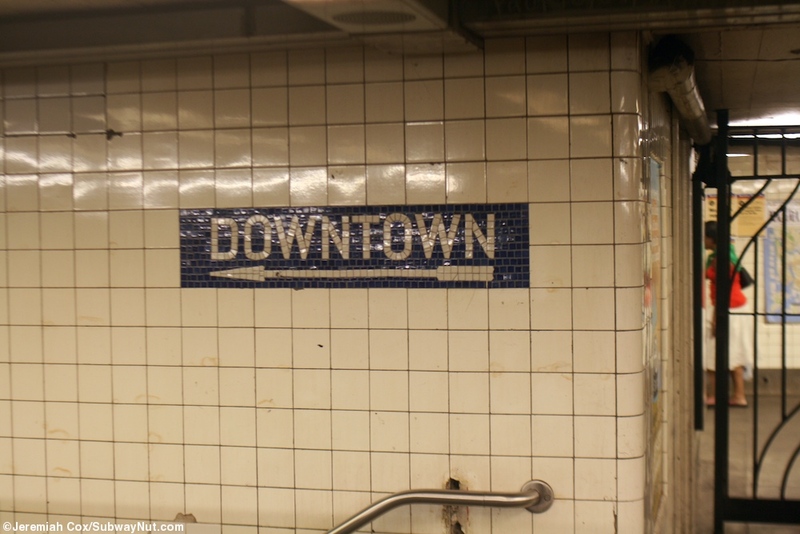 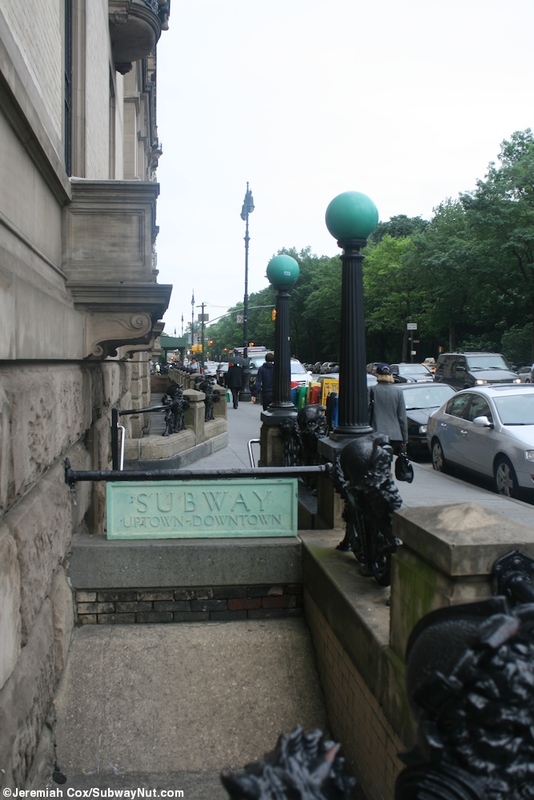 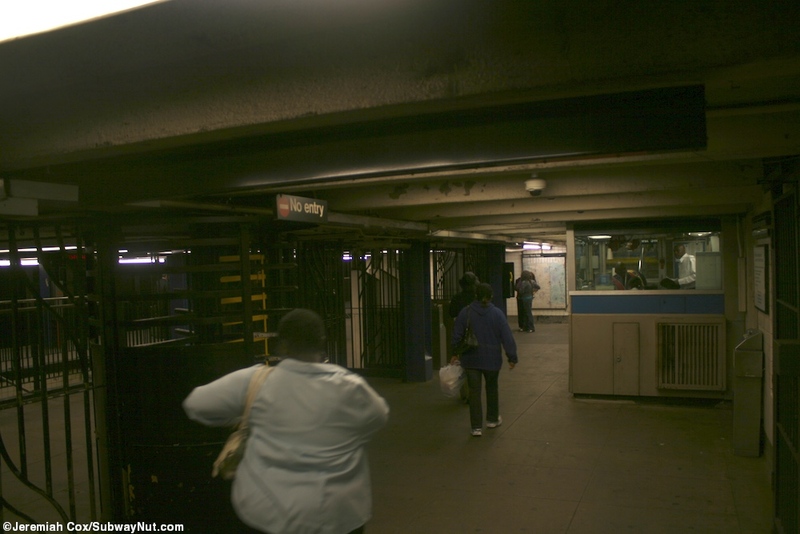 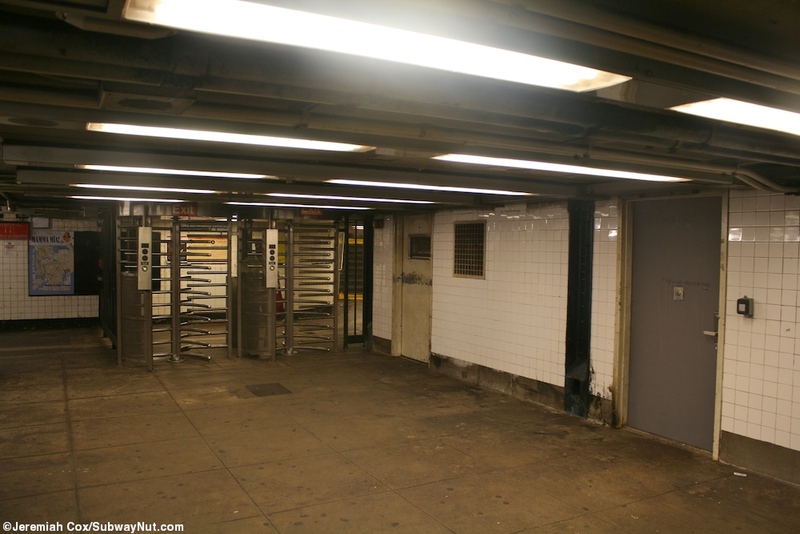 There is a secondary entrance at the southern end of the station with a single staircase up from the downtown platform to two high entrance turnstiles and a street stair up to the SW corner of 70 Street and CPW. 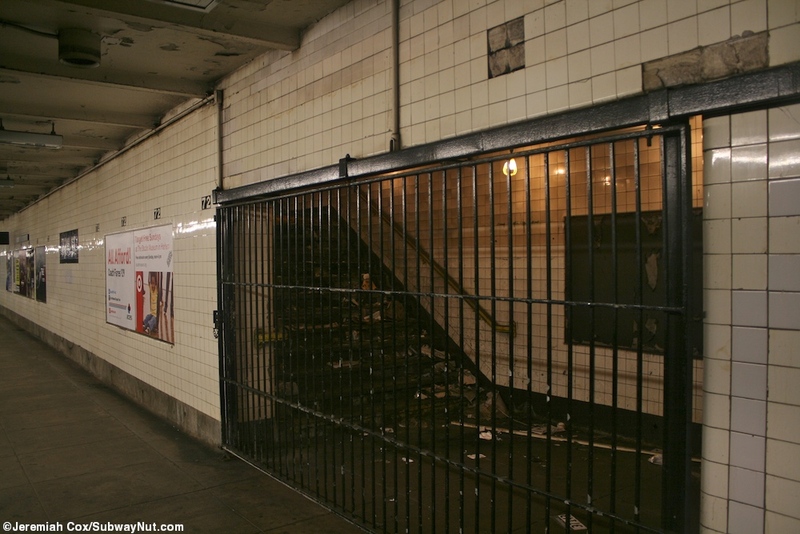 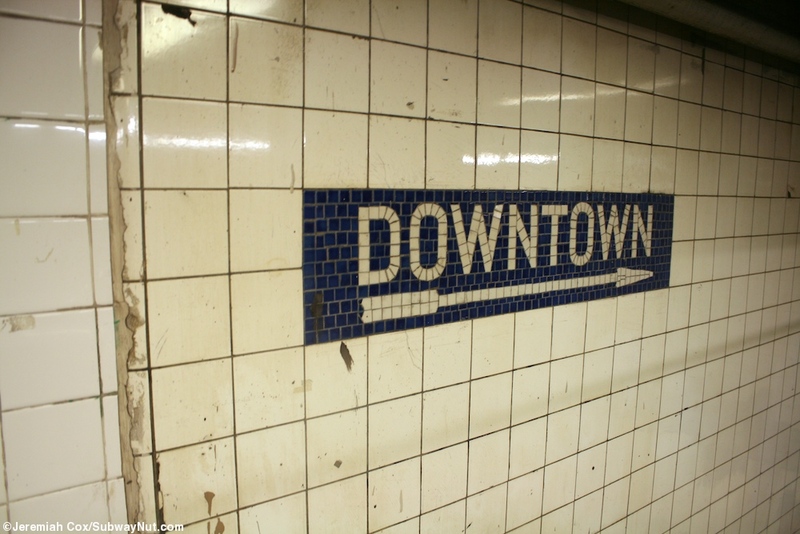 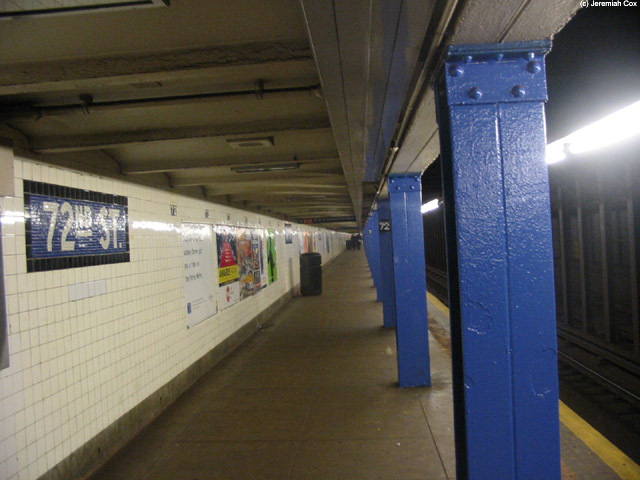 An abandoned exit used to lead up to 71 Street and there is evidence of this from a fenced off staircase on the lower level downtown platform, a newer section of tiled walls with doors on it on the uptown platform and some 71 exit direction tiling now visible that had been covered by W 72 St signs but vandals have removed. 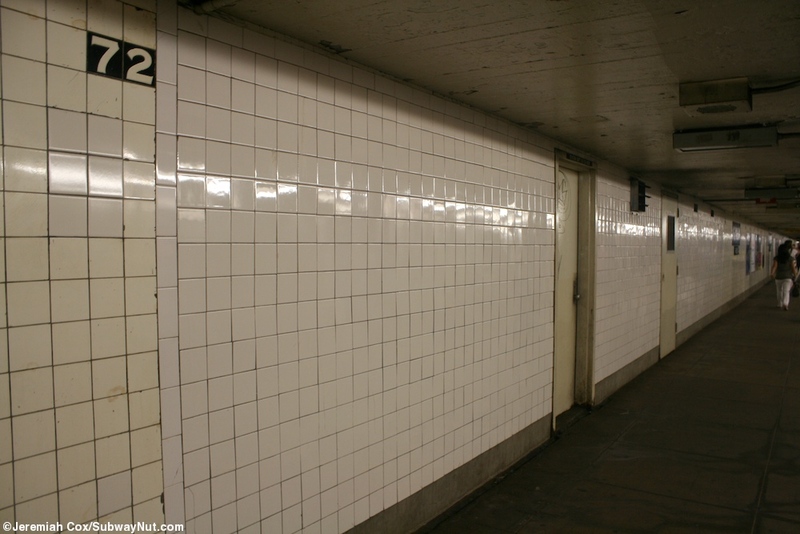 Other exit tiling has been painted over or replaced by white tiles that stand out against the walls with still original tiles. 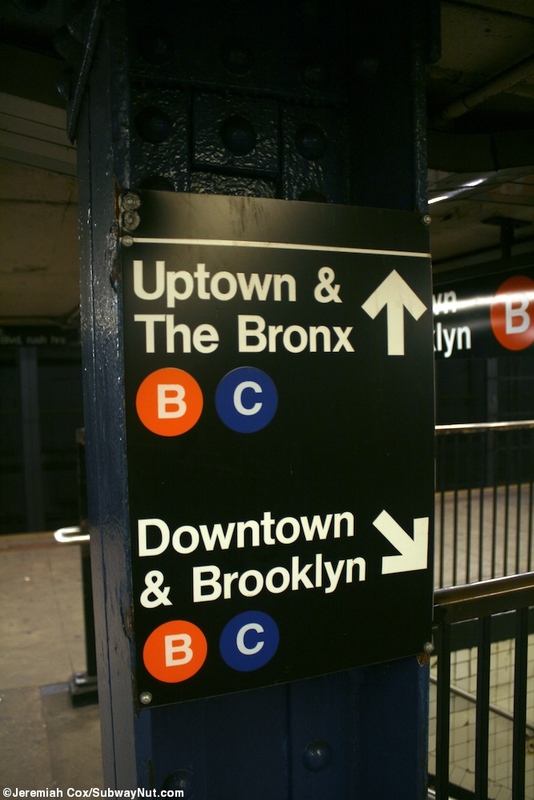 22 June, 2009 (72b8) Uptown or Downtown?